You'll begin your work in spot color by changing the framework behind the woman to the spot color. 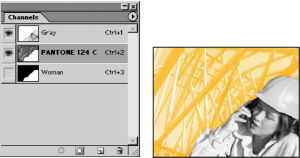 You must first select the framework, remove it from the grayscale image, and then add the selection to the spot-color channel. 1 In the Channels palette, select the Gray channel. 2 Choose Select > Load Selection. In the dialog box, choose Woman from the Channel menu and select Invert. Click OK to load a selection of the framework behind the woman. 3 Choose Edit > Cut to cut the selection from the image. Make sure that black is set as the foreground color. 4 In the Channels palette, select the PANTONE 124 C channel. 5 Choose Edit > Paste to paste the framework selection into the spot-color channel. In the 13Start window, the framework reappears in the Pantone color.